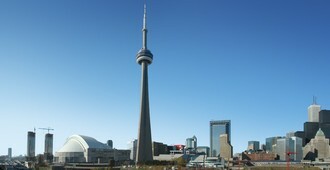 Being part of the Toronto Waterfront, Harbourfront is located on the northern shore of Lake Ontario. Since Toronto come into being this harbour is used for shipping and industrial purposes. Parks and public spaces like HTO Park, the Martin Goodman Trail, and the Waterfront WaveDecks at the foots of Spadina Avenue, Rees Street and Lower Simcoe combine to beautify the harbourfront and bring people to the water's edge.